My new musical obsession is banjo, due in large part to my new (used) Goodtime open back banjo by Deering. My last banjo related post described tools and accessories for my new banjo. This post will describe the basic setup I went through on my new instrument to make sure it was adjusted properly. The good news for beginners is you can find a lot of help on the internet. I particularly recommend BanjoHangout.org. I did a lot of research there regarding banjo setup. Another great source are youtube videos. Seeing and hearing is often more informative than just reading. I’ll include links as I go. Here are the basic things I checked and will review here in the order they should be done. This isn’t necessarily the order I did them the first time, but it is the preferred order. I made the point last time that most of the many pieces that make up a guitar are glued in place. There isn’t much you can do on an acoustic guitar to swap out components. Banjos are different. Most of the parts are bolted or clamped together. You can disassemble a banjo with a screwdriver and a wrench or two. This also means you can replace most of the components fairly easily. The starting point in our banjo setup is to make sure none of those bolted-on pieces have come loose. Check that the j-hook shoes are tight on the inside of the pot. Also make sure the neck bolt and coordinator bolts are tight. A Phillips head screw driver is needed for tightening the shoes. The nut and bolt below the coordinator rod attaches the neck. It should be tight. We’ll get to head tension and tailpiece adjustments in a bit. For now just make sure the bolt holding on the tailpiece is tight as well as the coordinator bolt on the other side of the rim from this one. 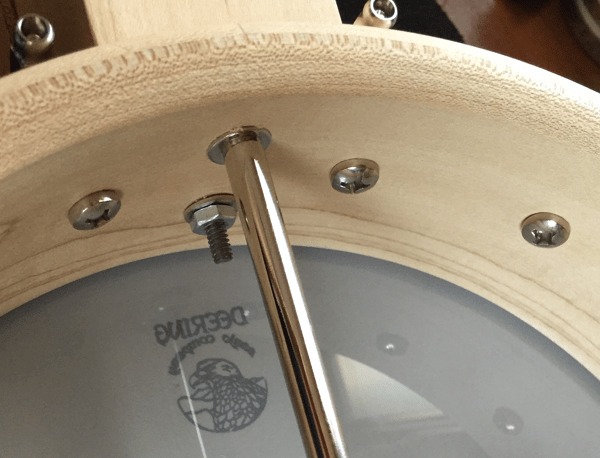 There’s a lot of advice on how to get your banjo head tightened to the best tension. Although there is general agreement that tighter is better, within reason, and that too loose is bad the methods to determine whether the head is tight enough vary greatly. 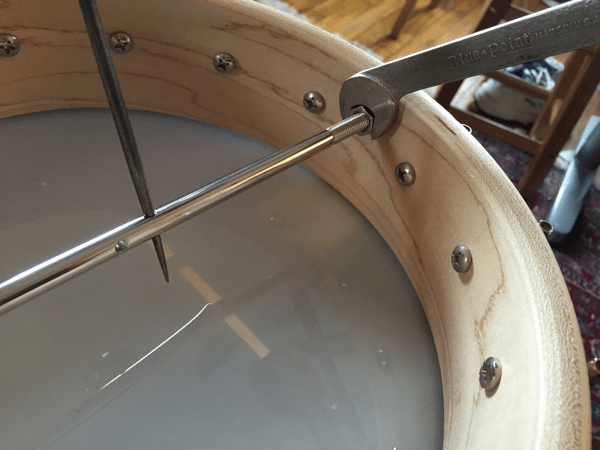 The most scientific methods use torque gauges to measure each nut or use a drum head tension gauge. I’ll ignore these for now since they require equipment I don’t have. The other end of the spectrum is to tighten until it feels right. Someone with experience would know this but a beginner like me wouldn’t. In between these two approaches are tuning by sound, tuning by head deflection measured by coin thickness and tuning to a specific frequency when you tap the head. It turns out that they are all related when done correctly — or by someone who knows what they are doing. The easiest method for a beginner is the coin method. You require a 10” straight edge that can fit between your banjo’s head and strings in front of the bridge. In the USA there is agreement among most that if a quarter just fits beneath the center of the straight edge, you’re at the correct tension. If a nickel fits easily, you’re head is probably not tight enough. However, some believe a nickel’s thickness gives them the sound they want. These are more likely old time, open back banjo players. I tried this on my Goodtime banjo and discovered my head had been too loose. I slowly tightened the head, turning the nuts on the rim hooks between 1/8 and 1/4 of a turn at a time in an even pattern. The sound is much better now that a quarter is about the thickness between the straight edge and head when I test it. I’ve read where some experts have discovered up to 3 different head tensions which will produce improved sound. If you adjust to a specific sound, the note most look for is G# or A. Some who have tried the coin method have discovered that a quarter’s thickness corresponds to a note of A when the head is tapped. Tapping the near each j-hook is also how to check to see if each nut is tightened to the same tension. If not, the tone will be different. You can also approximate the tension by feel as you tighten. Make sure you’ve checked the tension of your banjo’s head before checking the action (string height). Tightening the head will cause the effective height of the strings to increase. I adjusted my neck first. Lucky for me, the height was still comfortable after I tightened the head. But I did these steps in the reverse of the order you should do them. The Goodtime manual says the action should be measured at the last fret (22nd). 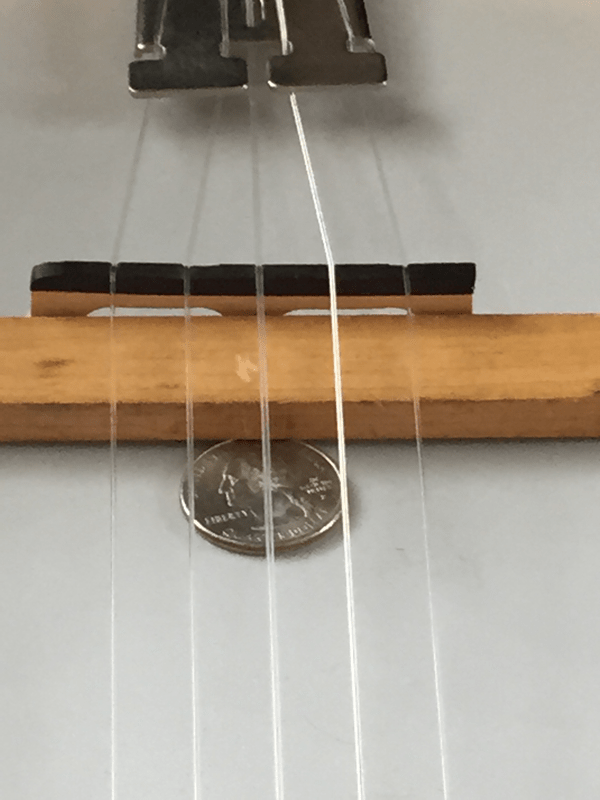 The distance between the top of the fret and the bottom of the string should be (approximately) between 1/8 and 1/4 inch. The action should feel comfortable when you play and should not produce any buzzing of the strings against the frets when you play. It is difficult to set the neck angle on an acoustic guitar. The traditional method of joining a guitar neck to the body is to use a dovetail joint which glues the neck to the body. If you need to adjust the action of your guitar you lower (or raise) the saddle (or the nut). Raising the saddle or nut means making a new one. Action height is typically measured at the 12th fret instead of the 22nd as the Goodtime manual suggests. The string height measured at the 12th will be a bit less than at the 22nd fret. 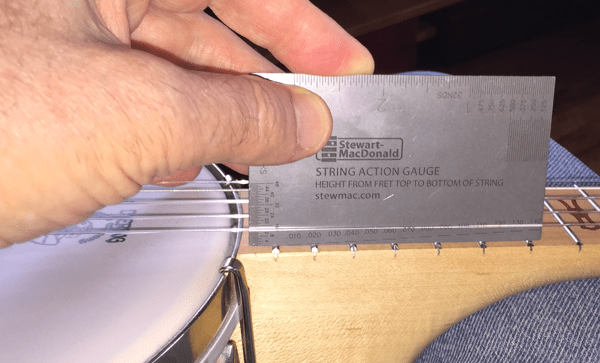 If you have a scooped fingerboard for clawhammer playing you can use guitar action recommendations for the 12th fret (about 3/32 inches) as a starting point. The banjo neck is bolted on and uses one or two coordinator rods which can push or pull the neck so the angle can be changed. This results in a change of string height. There are limits to how much you can adjust a neck but changing the neck angle is the preferred way to adjust the action on a banjo. The bridge height is generally set at some height by design. The Deering Goodtime banjo uses a 5/8″ height bridge and has a single coordinator rod as shown in the previous images. Note that vintage banjos and many better banjos use a traditional dowel stick instead of coordinator rods. You won’t be able to easily change the string height by adjusting the neck angle if your banjo has a dowel rod. 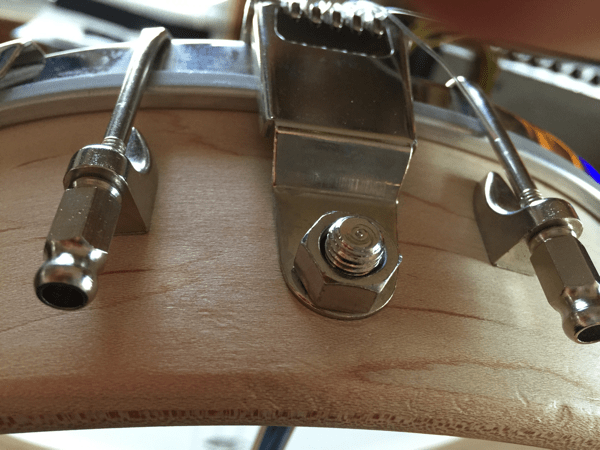 The neck angle is changed by holding the coordinator rod steady and loosening or tightening the inside and outside nuts at the tailpiece side of the rim. Loosening the inside nut and tightening the outside nut pulls the neck down and lowers the action (think of it as making the coordinator rod shorter between the neck and the tailpiece). The reverse pushes the neck up to raise the action (you’re lengthening the coordinator rod distance between the neck and the tailpiece nut). When you do this you need to hold the rod stead so only the nut turns. There are holes in the rod where you can insert a nail or other object to keep the rod from turning while adjusting the nut. I’m using an ice pick in the image below. The Tailpiece that comes on the Goodtime banjo can be adjusted up or down. Adjusting the distance between the head and where the strings meet the tailpiece changes the downward tension of the strings on the bridge. Lower gives more tension which should make the banjo sound brighter and perhaps louder. It’s a personal preference as to where you want this adjusted. Old time open back banjo players often want less tension. I raised the tailpiece as high as it would go. This is done by loosening the outside nut on the coordinator rod and sliding the tailpiece to the position you want it. The last step in our basic banjo setup is to make sure the bridge is properly placed. Measure the distance from the nut (edge that is towards frets) to the middle of the 12th fret (that is, to the highest point on the metal fret, where the string would touch). You don’t need to be super accurate. In fact, you don’t need to actually measure the distance. If you have a straight edge that is about 14 inches long use that and just make a mark at the 12th fret. You could use tape or sticky note to mark the distance. This is 1/2 the total scale length — approximately. Turn your straight edge around and place the bridge (the part facing the nut or where the strings would begin vibrating) at that same distance from the 12th fret. That is just an approximation of the bridge position. The next step is to fine tune the placement. This part requires that you know how to create a harmonic note by lightly touching a string above the 12th fret. Ideally this harmonic and the note you hear when you fully press the string at the 12th fret should be the same pitch. If they are not the same, you need to move the bridge slightly. If the pitch of the harmonic note is higher than the fretted note, move the bridge closer to the nut. If the pitch of the harmonic note is lower than the fretted note, move the bridge away from the nut. A chromatic tuner is helpful for this procedure. You should have one but if you don’t, get yourself an app for your mobile phone. You only need to check the first and fourth strings. If they’re set correctly you’re good.